China’s official currency has gained 34 per cent against the US dollar in eight years, according to figures released by the China Foreign Exchange Trading System. 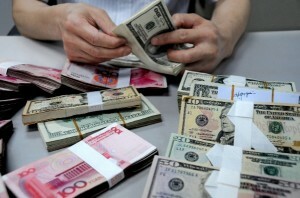 The central parity rate of the yuan stood at 6.17 yuan per US dollar on Monday. The yuan further strengthened around 20 per cent against the euro during the same period. Experts says after eight years of appreciation the currency’s exchange rate is close to becoming stable. The yuan has risen 1.6 per cent since the start of 2013, with the currency’s value going up in 65 trading days and down in 63 trading days. Recent GDP data that revealed a 7.5 per cent stabilising growth has buoyed the yuan.